It is always the right time to get engaged. Sure, there is a “wedding season,” but engagement season is all year round. There are millions of ways to propose to your boyfriend or girlfriend, but what is most important is that you personalize your proposal. And if you want to start off on the right foot, romantic proposal ideas are the only way to go. Do the two of you love going out to a particular restaurant? Are Friday night movie nights your thing? Do you share a lot of mutual friends? Do you happen to know she really wants her family to be included in the proposal? Regardless of how you propose, we are sure the moment will be perfect. If you need some romantic proposal ideas, you have come to the right place. Though it is extremely common, proposing at a restaurant has a bit of nostalgia to it. Movies and television shows have shown people getting engaged in restaurants for years, so there must be something romantic about it right? Take your partner to your favorite restaurant, or the restaurant where you had your first date, or even just a place that has great sushi. Ask before or after the meal. Do you two already live together? Great! Proposing at home is romantic, unique, and very personal. Even if you two don’t live together, asking her at her home or him at his home can be just as special. Family is important—to some more than others. If your partner is close to her family, consider incorporating them into the equation. Dinner at her parents’ house is a perfect time to propose. She’ll never expect it. Similarly, and maybe even more so, proposing at his (or your) parents’ house is very unique. If you would like to incorporate your family into the proposal, inviting everyone over to your family home is a great way to do it. Gather all of your friends together and throw a surprise party for your partner! Hanging out with a group of friends is always fun, but when there is a surprise at the end, it is even better. Love the outdoors? Who doesn’t? Proposing after a long hike will make you feel even more successful than usual. Maybe you two met at your local bar, or a nice restaurant, or at a friend’s party. No matter where you went on your first date, proposing at your first date location will be romantic and memorable. Are you chilling in Maui? Touring the Eiffel Tower? Staying at a bed and breakfast in Vermont? Regardless of where you are or what you are doing, proposing on vacation is always an incredibly romantic idea. Even if you aren’t in Hawaii, proposing on the beach—when you are warm, relaxed, and peaceful—is a great way to begin your life together. Relaxing at the beach is fun, but why not make it memorable? What is more romantic than a movie cliche? Hot air balloon proposals may seem like a thing you only see on television, but why does that mean they cannot come true? She’ll never expect it, and this is practically the king of romantic proposal ideas. Going to a movie on a Saturday night may not seem special, but if you pop the question it quickly will be. Ask your partner to marry you before the show begins and he or she is sure to be surprised. Why a fountain? It is beautiful and the perfect place for pictures. If you have a fountain in your community, go for it. There is always something special about the arts. If you and your partner are out on a fancy date at the opera or a play, plan your proposal. Wait until you are emotionally moved after the show, or you are excited before it. Your partner will be surprised and will never forget it. You know how fun fairs and carnivals are! What could be more fun than getting engaged while eating popcorn and interacting with the community? Farmers markets are full of fresh fruit, vegetables, flowers, and crafts. If you and your partner enjoy visiting the farmers market, why not propose there? What is more fun than working toward a goal? Treasure hunts or scavenger hunts are a great way to reveal your big surprise. Do you love to sing? Well even if you don’t, karaoke is a great way to surprise your partner. Pick a cliched romantic song and propose to your partner in front of your friends. Everyone loves a good song. Sure, dance lessons seem like they might come after a proposal, but why not get the lessons started. Sign you and your partner up for lessons and pop the question after a particularly impressive dance move. Taking a newspaper ad out in your local paper is the perfect way to express exactly how you feel. Sure, proposing via the internet is not the best for every couple, but if you two happened to meet online, it might be the perfect romantic gesture. Think of this as romantic proposal ideas gone digital. You can schedule things like elephant rides and in-the-park safaris at many locations around the country. Plan something adventurous and pop the big question. Even if you cannot necessarily paint, getting someone to create a wall mural for you might be the perfect way to propose to your girlfriend. If even carving your initials into a tree is romantic, imagine what a mural will do for you! Blow them up yourself and write, “Jane, will you marry me” on each balloon! Or special order a balloon that reads, “Will you marry me.” No matter how it goes down, balloons are always the best. There have been a whole lot of “lip sync” and “lip dub” proposal videos over the last couple of years, but that doesn’t mean the idea is over. It is romantic, exciting, and so much fun. Scrapbooking is thoughtful, romantic, and very memorable. Make your partner a scrapbook of your relationship and include a “will you marry me” page at the end. Corny? Sure, but will it be worth it? Definitely. 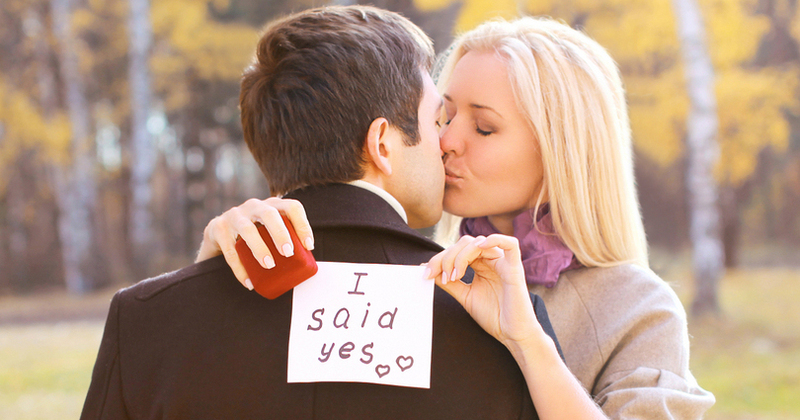 Pick your favorite proposal scene in a movie or a television show and pop the question. Mix-tapes never go out of style, and neither do playlists! Make a playlist that starts generally romantic and ends in something very specific—like Bruno Mars’ “Marry You.” If he or she doesn’t get the hint, drop on one knee when you are done listening. Rent a bunch of movies that have a similar theme. Whether they are marriage-themed, or just a general romantic comedy, your girlfriend will love the surprise ring at the end of the marathon. Because who doesn’t want a diamond paired with a perfectly crafted brownie? Exactly! And speaking of desserts, why not write a message in a cake? Have your local bakery make up the perfect cake (for any occasion) and simply write, “Will you marry me?” in it. No one says no to cake. Work can be tricky, sure, but if you happen to have contact with your partner’s boss or place of employment, it might be worth a try. Public proposals can be intimidating, but if you know your partner finds that kind of thing romantic, a work proposal is unexpected and very romantic. Is it winter and icy outside? Scrape a proposal into your partner’s car window before she gets into it in the morning. If it isn’t winter and/or icy, they make car markers for a reason. It is classic and it is adorable. Get a box of Cracker Jacks to hide the ring in. Take her out to a ball game and really play it off perfectly. Is it fall? Propose among the leaves! Is it winter? Propose while ice-skating at your local rink! Is it summer? Write her name in the sand. No matter which season it is, you can make something work. Holiday proposals are great, and usually unexpected. Though a Valentine’s Day engagement or a Christmas proposal may seem overdone, they remain unique because the holidays are unique to each person who celebrates them. If you aren’t a writer, it might be even more romantic to write a poem for your love. Proposing via proposal can be exceptionally sweet. Similarly, writing a song for your partner is touching, memorable, and a great idea for a proposal. If you happen to be a writer, or know someone who is, it is relatively easy to get published in this day and age. What is more memorable than having your proposal published in a magazine or on a website? Monopoly may not seem romantic, but having a Monopoly night sure can be. Pop the question while you and your partner play a rousing round of cards or a board game. It will definitely be unexpected. Do you have a dog? Do you have a dog together? Getting your / your partner’s pet involved is an adorable way to express your love. Tie a note around the animal’s collar and watch your partner melt. You don’t have to literally rent a skywriting jet, but even grabbing a pair of sparklers and writing “will you marry me?” in the air is extremely romantic. Have you ever been on a roller coaster? Your adrenaline is already all the way up—why not pop the question? Though your partner might not buy it until the coaster stops, the event will be memorable forever. Disneyland, Disney World, or any other major amusement park area is a great place to propose. Cliche? Nah. If your partner is easily caught up in the magic of a place like Disneyland, he or she will appreciate the sentiment. Who doesn’t want to get engaged at the happiest place on Earth? Photobooths are not only fun, they have built in memory-makers. If you are interested in having your proposal documented, a photobooth is the perfect way to go. On certain candy websites, you can engrave candy with specific messages. Being proposed to while eating M&Ms sounds kind of perfect. Another television and movie cliche, but always a good one. Hiding an engagement ring in lobster or quiche is maybe not the best idea, but hiding it in a glass of champagne or something less messy sounds like a great idea. Leaving for work before your partner? Perfect. Write a message with an easy-erase marker (or with lipstick) and await his or her excited reaction. Hiring a singing telegram may seem corny, but some people love corny. Barbershop quartets may seem outdated, but everyone loves pinstripes and a classic tune. Why not propose in the sand? A simple message in the sand is a classic for romantic proposal ideas. Indulge in it. Winery tours are fun, informative, and classy. Why not ask your partner to marry you after a long and educational tour? You are in the perfect place for a toast right after he or she says yes. For a happily ever after…. No matter how or where or when you propose, you want to make sure it is perfect. By following any (or all!) of these romantic proposal ideas, you are sure to have the perfect, most unique and the most romantic proposal. Congratulations to you both!